Very Good. In this extraordinary collection of twenty tales, Richard Ford, a master short-story writer in his own right, has selected his personal favourites, including familiar masterpieces as well as several brilliant lesser-known tales. Text in English, Russian. 368 p.
Good. In this extraordinary collection of twenty tales, Richard Ford, a master short-story writer in his own right, has selected his personal favourites, including familiar masterpieces as well as several brilliant lesser-known tales. Text in English, Russian. 368 p.
Very Good. The Essential Tales of Chekhov by Chekhov, Anton. Trade paperback (US). Glued binding. 368 p. Contains: Illustrations, black & white. New. 1999. 1st Edition Thus. Paperback. 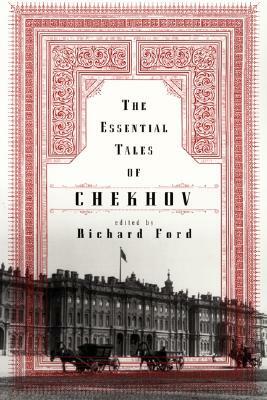 In this collection of 20 short stories, the editor Richard Ford has selected his personal favourites of Chekhov's work. Includes are "The Kiss", "The Darling", as well as lesser known tales such as "A Blunder", "Hush" and "Champagne". Translator(s): Garnett, Constance. Num Pages: 368 pages. BIC Classification: DQ; FA; FC. Category: (G) General (US: Trade). Dimension: 198 x 130 x 27. Weight in Grams: 280......We ship daily from our Bookshop. New. Text in English, Russian. 368 p.